Stamps offer an interesting way you present your idea. All you need is to apply some ink, press the stamp on the substrate and you have a clear and crisp image right in front of you in less than 2 seconds. However the way people use address stamp, or mix and match their stamps to create everything is just amazing. Stamps can be used to create embossed images and can easily be altered using water colors, acrylic paints or stamp pads. 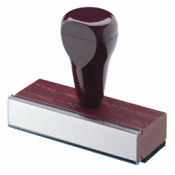 You can choose to get your stamps customized to fit your requirements. You can get hand stamps customized into address stamp, hand craved stamps or art stamps. There are no limitations on the creativity and uses of hand stamps. Use the following tips to take your craft project or your official work to a new perspective on stamping. Do you know you can even turn your favorite doodle design into stamps? Start by using sheets of Inovart’s Presto Foam and draw your design directly on the foam with a ballpoint pen. This will help you create groves however the ink lines won’t show. Next, spread some acrylic paint on the sheet and roll it out with a brayer to evenly coat the stamp. When you are done with the pain covered stamp, you can even use it as an embellishment in your artwork. Stamps and polymer clay can be used together to make great impressions. Apart from address stamps, the stamps can be used to create textures and design on the clay. After stamping the clay, you can sand the surface to create more texture. You can use the stamps to create interesting layers in your artwork. Start by stamping the sheet with the stamp and then add texture and layer it up as you proceed with the design. Add texture by carving into wet paint using the texture tool. As you proceed, it will be more interesting to see the finish product. Have you ever stamped a focal image on a piece of paper only to discover that it wasn’t completed stamped? If so, choose to stamp with pre inked stamp to present a good stamping image. Shop stamps online at the Ideal Stamp Shop.